Photo gifts are by far the best gifts to both give and receive. They are meaningful, can be personalized, and the gift focuses on what matters most – those relationships and special moments you’ve shared. This year, for Father’s Day, we’ve teamed up with Shutterfly to take your photo gifts to a whole new level! We’re sharing 9 incredibly easy projects that can be done in five minutes or less that will make your photo gifts pop! He’ll love the photo cube to adorn his desk or nightstand. 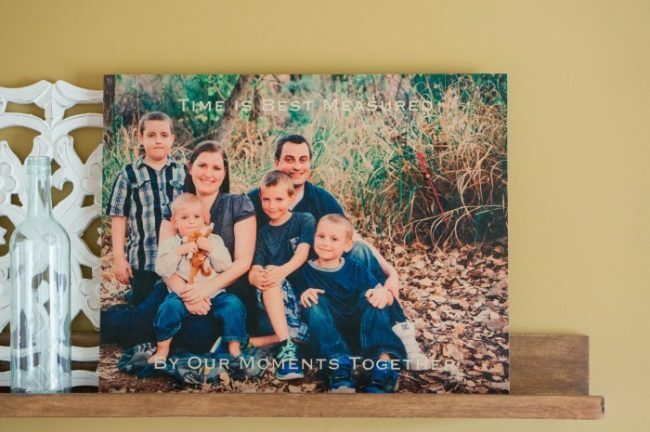 It’s a great way to make a unique statement with some of dad’s favorite pictures and memories. Adding a little personalization can take it to the next level. 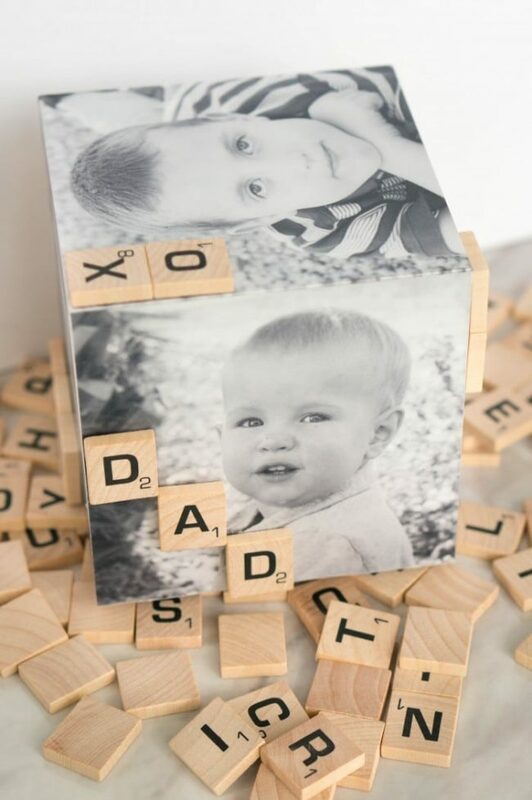 To personalize a photo cube, just use a little dab of mod podge or hot glue to tack on an assortment of scrabble letters to add your own special message. We added “We Love You Dad” to make a sentimental gift he will treasure. Spoil dad with an assortment of pictures of all of his favorite people. Then, add a few signatures or a quick note from each person next to their picture for a gift loaded with sentiment. Plus, you can order the photo mug with Ghirardelli chocolates inside! 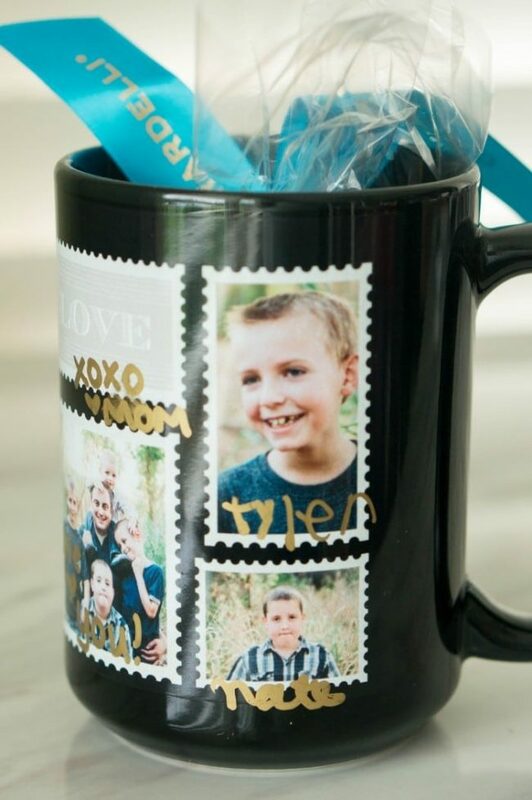 Design a photo mug with a picture from each of the children or every member of the family. The Love Stamp Mug is a great one for this as you can add words and pictures! Let each family member sign the mug by their picture using an oil based paint marker. Then bake the mug at 350°F for 30 minutes, then allow to cool. Hand wash the mug to keep your design in good condition. Adding an extra element to the gift will give it texture and make the gift seem like you put in a ton of time and thought, when really the gift was a cinch to put together and easy to add a little extra. We picked a Bracket Shaped Desktop Plaque and added a favorite photo. We also used Shutterfly’s text personalization tool to add a message to dad, too. From there, just string twine or embroidery floss across the front of the photo gift and add a charm that fits the occasion. Won’t dad love a personalized mug with a handprint to remind him of one of his favorite people each morning or at the office? It’s a cute and easy way to preserve the size of those tiny hands on something practical and useful. To customize a photo mug, we started with this design, just add your favorite picture or two. Keep in mind some spacing for a handprint when you’re selecting your photos to use. 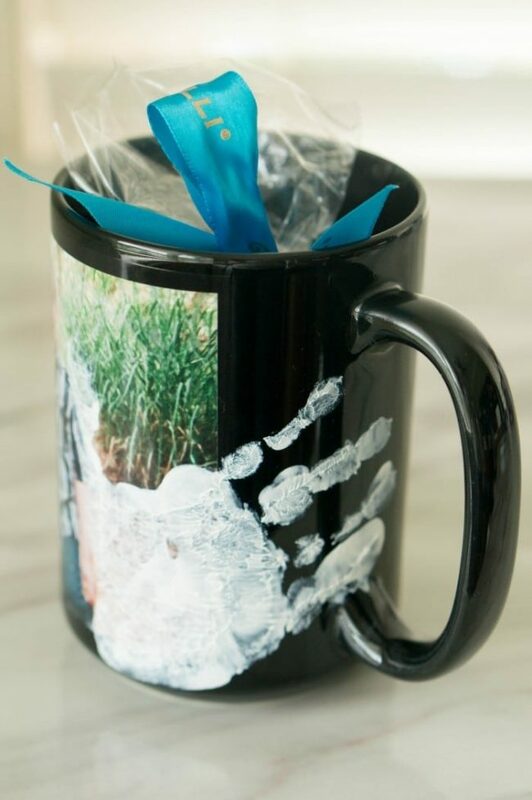 Use acrylic paint to add a handprint right to the mug. Bake the mug at 350°F for 30 minutes, then allow to cool. This will cure the paint. Hand wash to keep the design looking pristine. This idea will leave dad with a sweet message and preserve your handwriting in a special way. It will easily become a gift he will treasure. 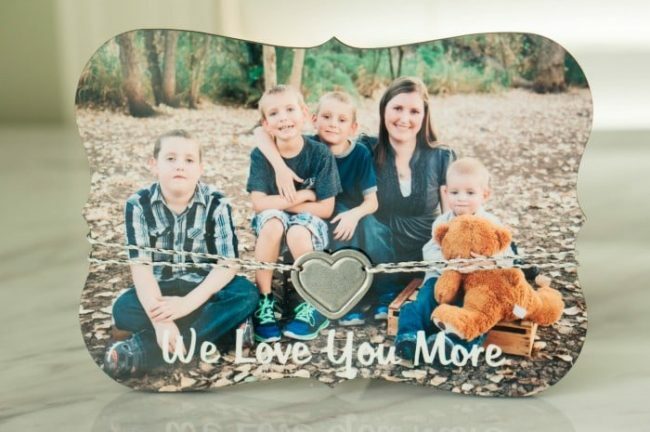 Start by printing up your favorite, meaningful, photo on a desktop plaque. Use an oil based paint pen to leave a message that will last. 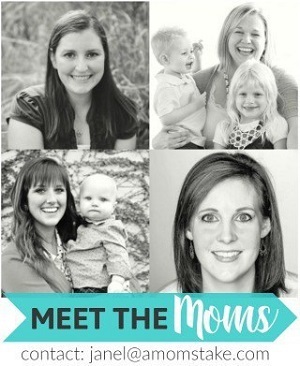 We have a saying in our home that each name is our “favorite” person in the whole wide world with that name. So do let dad know he is really the best, we wrote on “Our Most Fave Dad” with a silver paint pen to give a special shine to the print. 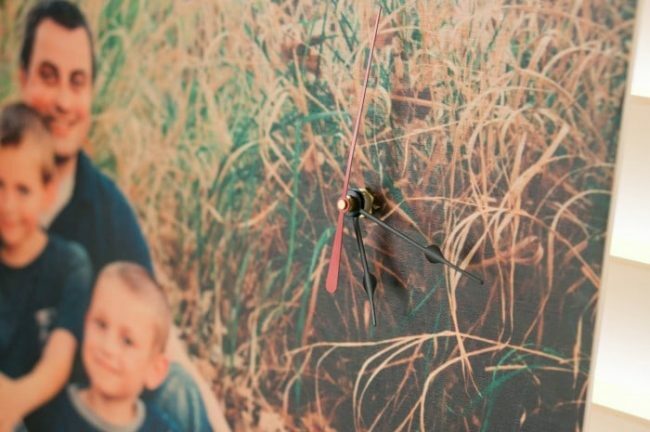 What better way to remind dad of all your favorite times together then with a personalized photo clock that’s custom made! The Wood Wall Art turned out amazingly beautiful! I knew this would be a precious keepsake. We customized our wood wall art print by adding a clock kit and drilling through the print just big enough to accommodate the clock kit. Keep in mind when choosing the clock hands that sizing is important. The hands will need to make a full circle, starting at 12 and moving all the way around and back up to 12. You can measure how much space you have available, and choose hands at least half the total size to make sure you have enough room for the clock hands to make their circle around the hours. We went with small 2.5″ hands. 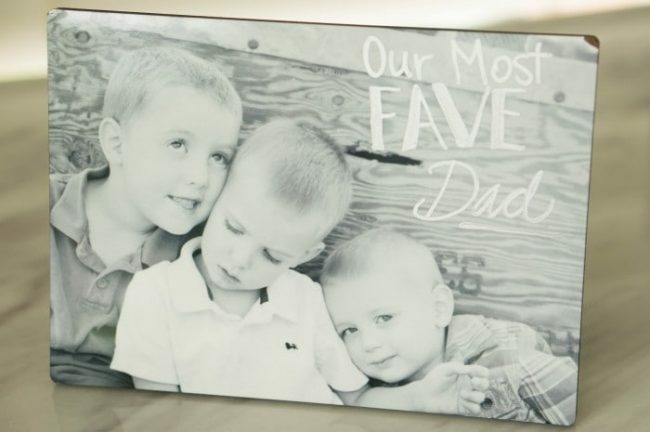 My boys love to make big posters to celebrate each birthday, so when it came time to brainstorm for Father’s Day, I knew they would love creating big cutout letters spelling “Dad” and adding a special touch with photos adds a finished look to the gift. 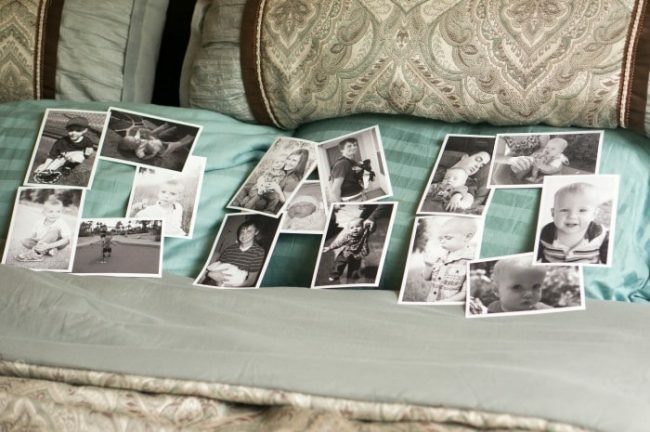 Begin by printing 100 or so of your favorite pictures of your favorite memories with dad. I choose to print all of my images in black and white and with a .2″ white border to give them a cohesive look and feel. Cut out big letters from cardboard, then glue each picture framing out the letters to make a customized collage. If you’re short on time, Shutterly’s Collage Posters can have a lasting impact and save time. A paperweight is a really unique gift as it’s not the first photo gift idea that comes to mine, and it’s helpful! Making it customized with a photo will let him show off his favorite people to his coworkers. 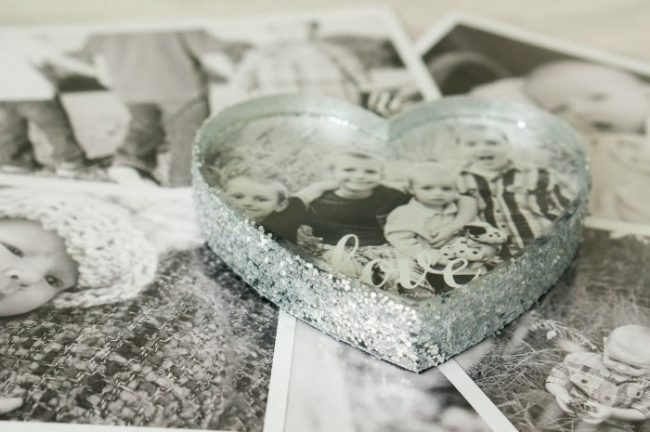 Shutterfly has some really cute paperweights to choose from, pick a square, dome, or heart shape and customize with your own pictures or phrases. I personalized the Love Script design with the Heart shape. Apply a thin layer of mod podge around the base of the paper weight. Sprinkle glitter until generously and allow to dry. Make homemade cards and stack them under the paper weight, and leave it on his desk, for a welcomed surprise! 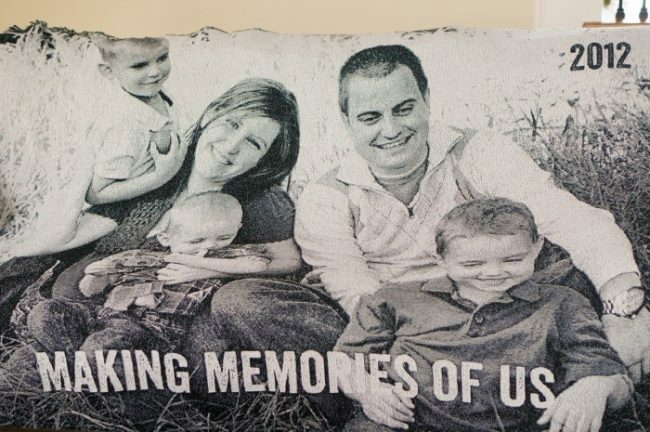 Dad will love cuddling up with a soft blanket that holds a personal meaning to him. 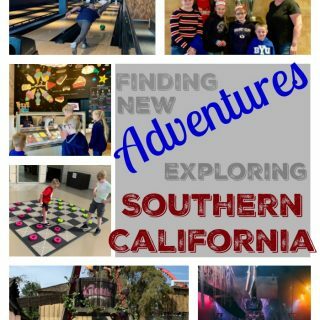 This gift was focused all around one of my husband’s favorite activities – movie night! 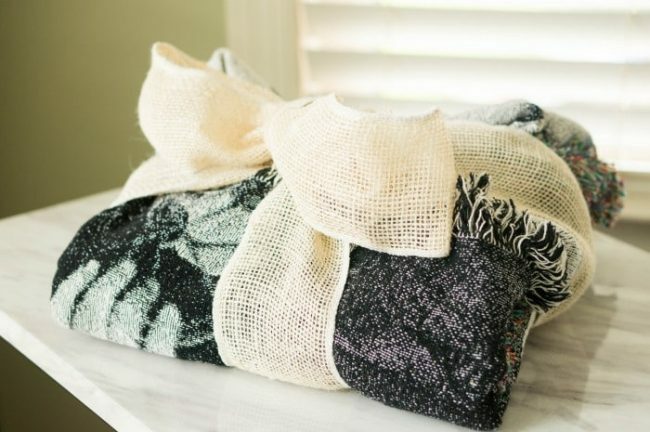 First, you will customize a Woven Photo Blanket, then use it to wrap up a gift to coordinate. We created a movie watching bundle that we can all enjoy with dad as we snuggle up on the couch with the gorgeous new blanket. In this quick 1-minute video, we’re demonstrating how we personalized a couple of the gifts shown above! If you want to see the DIY’s come to life, hit play! Open your photo galleries and get ready to be inspired for your own DIY projects to make a photo gift for dad this year. Just flipping through your photos will start inspiring you for the perfect gift around that absolutely perfect photo that holds those precious moments that will be the most meaningful part of the gift. When you’ve found your perfect photo, try one of our easy DIY’s above to really take your photo gift to the next level, or try something you think up. 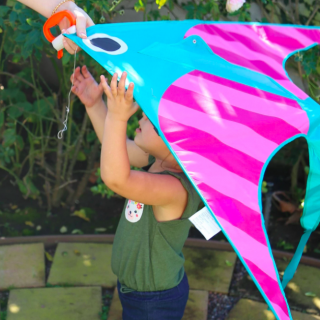 Either way, that little extra something will take your already meaningful Father’s Day gift and create something he will cherish for years to come. Visit Shutterfly.com to get started customizing your own perfect gift for dad this Father’s Day! 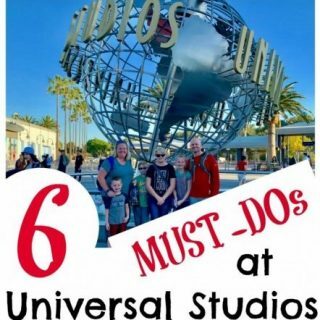 Previous Post: « Easy & Cheap Things to do When You’re Bored for Kids and Families! 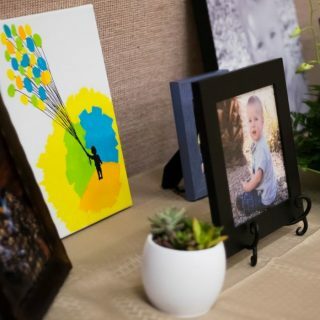 Photo gifts is an amazing gifts idea. I had some incredible moment with my family especially with my father but my lovely dad has gone last year. I wanna live with my father photo. I will make a lovely family photo album. Thanks for remembering my important task. These are great tips. I am just now doing a photo project for my daughters school! I love Shutterfly. The picture gift ideas are always helping you stay creative. Great ideas for Father’s Day gifts. This is so great and creative. It would make great gifts for any occasion. I think that personalized gifts truly speak from the heart. If you really love someone, then personalizing their gift is the right thing to do. I love these ideas. I love the idea of adding the hand print to the mug with the photos. I have many family members who would love this. I am loving these gifts! That clock is beautiful and would be so lovely for someone’s office. 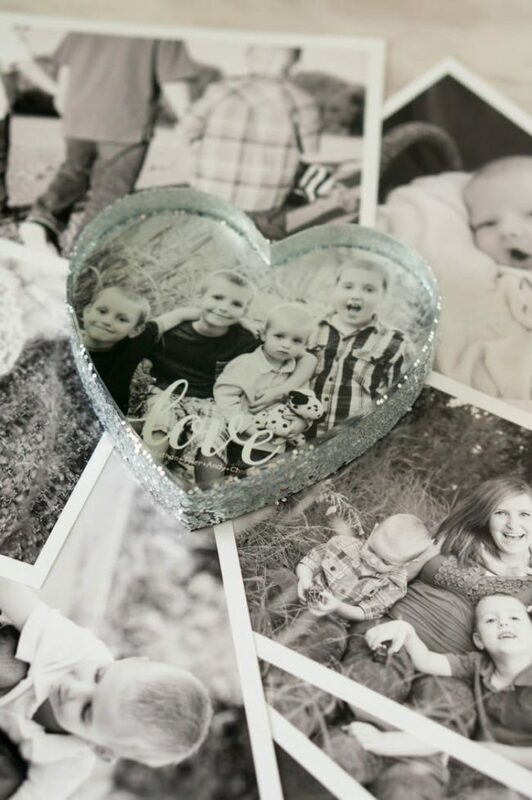 I love Shutterfly and all of their great photo gift ideas. These ideas for making the gifts even more special are perfect! I love that you customized your photo gifts to make them even more unique. We try to do this too with our gifts. Beautiful gift ideas for dad! It’s always nice to give them something that will remind them that they’re loved and these photos are simply perfect. I like how you personalized each one too! I love the Scrabble cube! Scrabble is one of my boyfriends favs, so this would be perfect for him! I love to scrapbook so photo gifts are right up my alley. I love the photo with the scrabble pieces worked into it. Photo gifts are always so special. I just had a mug made for a Fathers Day gift. I think photo gifts are so much fun to give. Shutterfly always makes it so easy with all the cool features products they offer. These are such clever ideas! I like your use of Scrabble letters. The wood wall art with the clock looks super nice as well! All of these gift ideas look incredible. So many different options that you could give everyone something different. These are such great gift ideas. What Dad wouldn’t treasure them? My favourite is the one with the Scrabble tiles. So cute! These ideas are really neat! I love the Scrabble tiles being upcycled for that one, it’s awesome. I have a lot of word lover’s for friends who would totally love to receive something like that. I know what I’m doing this summer…searching garage sales for old Scrabble games with missing pieces! These are great ideas! I love adding in a three dimensional effect like the Scrabble pieces.